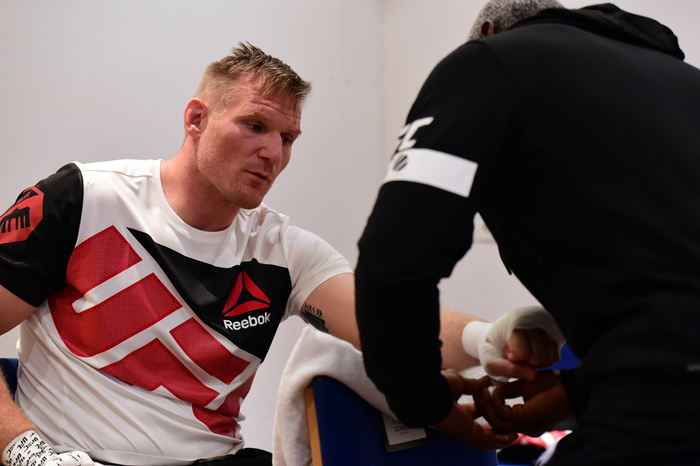 Andrei Arlovski and Josh Barnett had themselves a good little barnburner at the top of the UFC's Hamburg card over the weekend. Even the most heavyweight-opposed fight fan would have to admit that. On a card of largely unremarkable decisions, the big lads came out and had the most explosive thirty seconds of the entire night. From there the bout took on a more grinding pace, as favored by Barnett, and by the third round there was little of Arlovski's disconcerting speed left. The first thirty seconds demonstrated Andrei Arlovski's dilemma in a nutshell. If he doesn't get to work quick with his right hand, his opponent will start trying to find his suspect jawline. This was most evident against Brett Rogers and Sergei Kharitonov. Against Barnett, Arlovski circled and showed the jab which rarely does anything meaningful in his fights. Barnett clipped him with a right hand and Arlovski stumbled but recovered quickly. Barnett, thinking he sensed an early knockout, rushed in and Arlovski went to the opposite extreme and swung hands like a madman, clipping Barnett and hurting him in turn. But then Arlovski's oldest habit got him into trouble. A good boxer will “close the door” with a jab or a left hook—putting him behind his lead shoulder again and hitting the opponent if they step in on him after he has exposed himself more by squaring up for his right hand. But instead of snappily resetting his position with a punch, Arlovski slowly reels his spent right hand in like the cord on a vacuum cleaner—occasionally throwing a meaningless left hand from down by his waist as he loads up the right again. This means he eats a lot of counter right hands immediately after he has thrown his own. Barnett scored with that right hand after Arlovski missed an uppercut in a flurry and suddenly Arlovski was on the defensive again. The two fell into a clinch and Arlovski landed one more good right hand before they hit the fence. This was where Arlovski was supposed to have a hard time but as his sterling takedown defense record will attest, he can stop opponents from having their own way along the fence. Where Barnett was free to pummel for different grips and open up with strikes against Frank Mir and Roy Nelson, Arlovski did a good job of pummeling for biceps ties or wrist control (with the occasional glove grab) to stifle whichever hand Barnett was trying to free. It was enough trouble for Barnett to simply hold onto Arlovski for most of the fight and the referee often broke them for inactivity. As Barnett attempted to free his left hand in the first round, Arlovski shot through for an underhook and drove off the fence to hit a well-timed outside trip. When the two hit the deck, Barnett showed his usual unorthodoxy from the bottom. Underneath Arlovski in half guard, Barnett reached up over his head to attempt an Americana (or 'top wristlock' for the catch wrestlers who will doubtless be reading an article on The Warmaster). It’s a strange technique to attempt from the bottom but it saw Arlovski posture to escape the threat and get to his feet. Arlovski then spent almost an entire minute standing in Barnett's guard as both caught their breath and did enough to avoid getting stood up. One of Arlovski's better moments on the feet came as he feigned the same looping right hand that he has thrown constantly through his career, then jolted in a right as straight as an arrow between Barnett's hands. Another attempt at the outside trip in the second round saw Barnett better prepared as he used Arlovski's momentum to hit an elevator of sorts into top position. This proved a pivotal moment in the fight as Barnett was able to pile on the punches from top position after advancing to mount. Arlovski pressed into an over-under along the fence and shucked his head free to move to Barnett's back. It was here that the spirit of the late, great Billy Robinson shot into Barnett. Linking his arms for the double wrist lock, Barnett sat to the mat and kicked Arlovski over the top of him. The Kazushi Sakuraba special claimed another victim. Arlovski was stuck underneath Barnett threatening to finish the kimura/double wristlock/ude-garami for a while, but the technique serves more of a place as a positional handle leading into back attacks and guard passes than as a finishing hold in modern grappling. Barnett advanced to mount again and walloped Arlovski until the former UFC champion turned his back and tapped to a choke, which seemed like a formality by that point. While Barnett won the bout he took some dings, and while Arlovski lost another one by a rough finish inside the scheduled rounds it was a reminder that he grapples a lot better than his almost entirely striking based offence would have you remember. UFC Fight Night 93 was not a particularly entertaining card. A lot of close, unremarkable decisions and few finishes to grab onto—Ryan Bader's perfectly time Joachim Hansen style intercepting kick/knee being most notable. But Barnett and Arlovski put together a better fight than most thought they had in them.